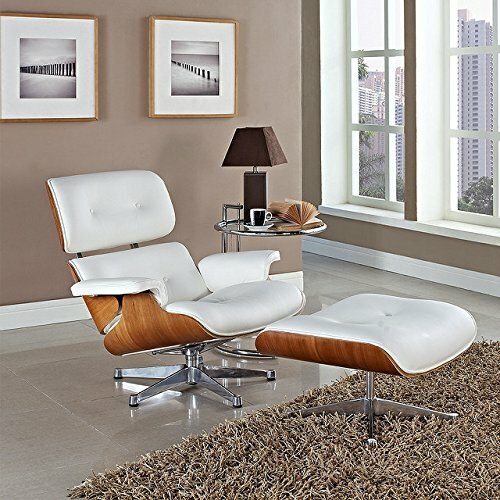 The MLF Eames Lounge Chair is a great blend of style and comfort. Recliners are some of the most comfortable chairs money can buy, but often times they can lack style. 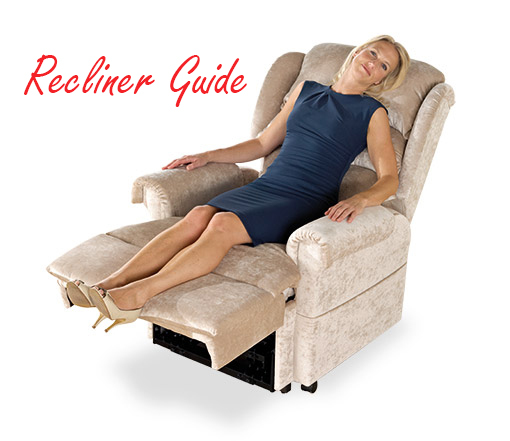 The standard bulkiness of recliners plus traditional fabric upholstery can make them feel immediately outdated. 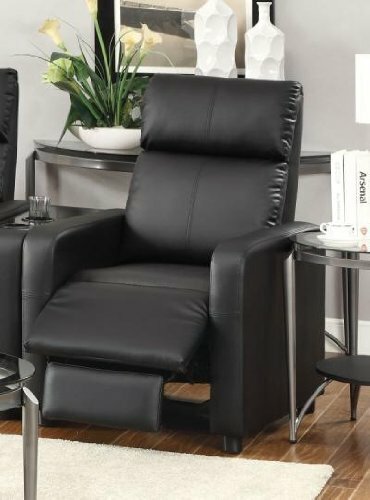 Contemporary leather recliners provide a perfect compromise between comfort and modern style for those who want to keep the look of their home more current. 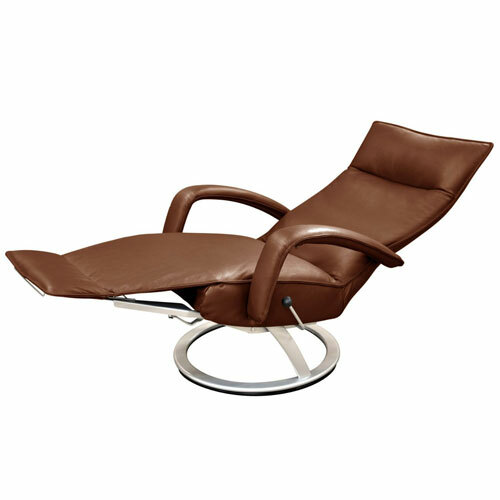 To achieve a low-profile modern aesthetic many contemporary leather recliners make use of a reclining chair plus an ottoman, though some models manage to accomplish the modern look with one-piece recliners. 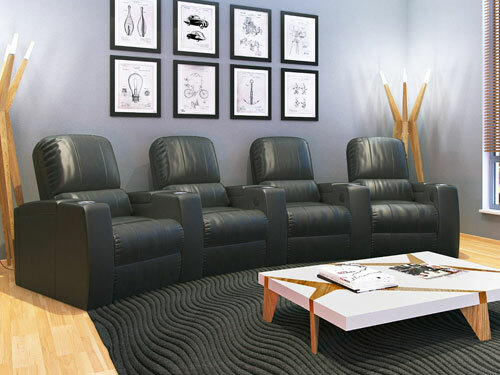 We’ve put together a list of some of the most stylish contemporary leather recliners to provide an overview of available styles and options. You’ll notice that some models use imitation leather upholstery while others use genuine leather, and that the genuine leather models are higher on the price scale. Continue reading below our comparison list for a more detailed look at a few stand-out models. We hope the comparison chart above is helpful in getting a quick sense of the variety of contemporary leather recliners that are available at different price ranges. Below we dive into a few of our favorites and go into more detail about what sets them apart. 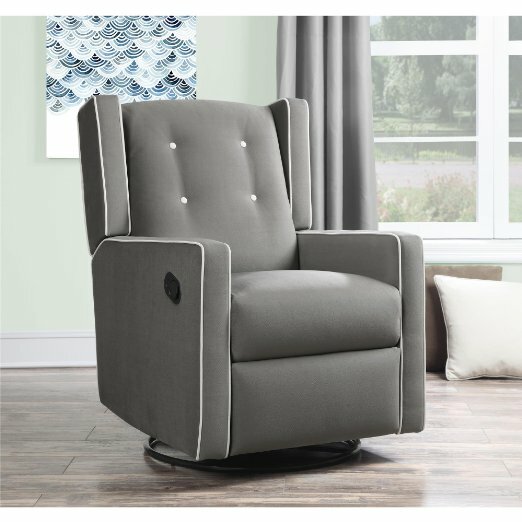 The Coaster Home Furnishings 600181 Contemporary Recliner is one of the rare models that manages to capture the contemporary look in a one-piece recliner. This chair is a push-back model and maintains a low profile. It measures 32.5 inches wide by 28.75 inches deep by 41.75 inches tall. The price point for this model provides good value, and it is one of the least expensive options on our list. One reason for the low price is that it is upholstered in a black vinyl leatherette rather than more expensive genuine leather. Another factor for explaining the low price point is its construction is not designed to last a lifetime, but rather can hold up to only a few years of regular use. This chair comes with a conditional 1 year warranty. 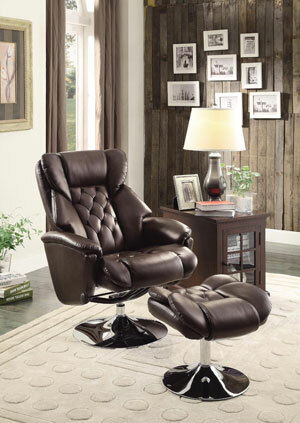 All things considered, this chair is a good contemporary leather recliner for stylish living rooms on a budget. The MLF® Plywood Eames Lounge Chair & Ottoman makes a strong statement. Its shape and the combination of wood grain and leather in the chair’s design are undeniably eye catching. Lets go over this chair’s construction first. The upholstery of this chair is either Aniline Leather or Italian leather (including the buttons and piping) depending on your preference. The wooden parts of the chair feature a 7-ply laminated veneer in natural colors that is made to pass the test of time. It also has a cast Aluminum base with 360° swivel. These features together mainly explain the relatively high price. This chair does not have an adjustable reclining function, but rather is fixed at backward tilt of about 15°. The cushion on this chair is a high-elastic soft foam that offers great resilience. People who have bought this chair are very pleased with how comfortable it is. Now lets cover the style variations. This chair offers an array of styles. Firstly, you have your pick of five colors of leather: Black, Dark Brown, Light Brown, Red, or White. Secondly, you can choose between Aniline Leather and Italian Leather. Thirdly, you have your choice between Palisander, Natural Oak, or Walnut wood veneer. As you can see these options give you a lot of flexibility in ordering a chair that perfectly fits your style. The Gaga Recliner Chair by Lafer is a unique model that quickly grabbed our attention. It has a startlingly compact design that at first glance doesn’t even look like a recliner when in its upright position. It measures just 40 inches high by 29 inches wide by 31.5 inches deep. This model has a steel frame and a 360 degree swivel base. Its adjustable reclining mechanism allows for a backrest incline range between 90 degrees and 170 degrees. It also has a retractable footrest. The upholstery is high-quality top grain leather and is available in thirteen colors: White, Magnolia, Ice, Banana, Beige, Black, Brown, Cherry, Grey, Mint, Red, Saddle, or Sand. Reviewers have high praise for this chair, and it has garnered a 4.8 out of 5 star rating. Keep in mind this quality and satisfaction comes at a steep price, and this model is the most expensive on our list. If you’d like to look at more contemporary leather recliners, see our article on Natuzzi recliner chairs.